Bookings open on the 5th September for the world’s largest, free, youth film festival, a UK-wide, education focused event for schools, colleges, youth leaders and home educators: www.intofilm.org/festival. Taking place from November 7-23, the sixth Into Film Festival offers 2600 free screenings and events, with teaching resources, for 5-19 year-olds, many linked to subjects in the curriculum. Last year’s Festival saw over 487,000 people attend. Key themes include mental wellbeing, diversity, anti-bullying and activism. ‘F-rated’ titles, championing the role of women in film, careers information from industry experts, and a nationwide review writing competition to promote literacy and critical thinking will all feature. 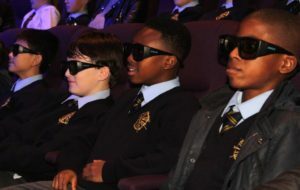 The Festival is hosted by education charity Into Film and made possible by funding from Cinema First, the BFI, a wide collaboration with UK cinema industry partners and delivery partners We Are Futures. In addition to all major cinema chains venues this year will include The British Library, Shepperton and Pinewood Studios, Edinburgh Zoo, Folly Farm in Wales and Ark Farm in Northern Ireland, London’s Cinema Museum, Croyde Deckchair Cinema in Devon, the Tramshed in Cardiff and Kinema in the Woods in Lincolnshire, a pavilion converted into a cinema in 1922. The Festival opens on November 7 with simultaneous pupil premieres of The Grinch, starring Benedict Cumberbatch, in Belfast, Cardiff, Edinburgh, London and Manchester. Film titles are mapped against the curricula of all four nations. Highlights include screenings of Peter Jackson’s First World War documentary They Shall Not Grow Old, Bohemian Rhapsody, Mike Leigh’s Peterloo, adaptation of ‘A’ level novel The Little Stranger, Mary Shelley, Mary and the Witch’s Flower, documentaries Whitney and McQueen, and award winners The Shape of Water, The Post and Three Billboards Outside Ebbing, Missouri. Over half the screenings offer audio-description and subtitling and this year sees an increase in the number of autism-friendly screenings.